Looking for Christmas candies to make at home? Part of the joy of the holiday season is to fill your home with the laughter and the smells of homemade candy making! We've got dozens of great ideas and recipes for delicious treats, starting with this wonderful, yet simple, pretzel kiss candy. Anyone can make this simple treat, even if you are notoriously a flop in the kitchen. You don't have to mix, stir, blend, or sift. In spite of that, you'll surprise and delight everyone with these yummy salty and sweet treats. Have you ever noticed how wonderfully well chocolate and pretzels go together? It's one of my favorite combinations! Your biggest problem will be keeping enough of them made up to satisfy everyone's wishes! Preheat your oven to 325 ° F. or 170 ° C.
Line baking trays with waxed paper and place a single layer of waffle shaped pretzels on each tray. 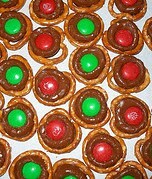 Unwrap (of course) the Hershey's Hugs or Kisses and place one on top of each pretzel. Place in the oven for 4-6 minutes. (The hugs tend to melt faster than the kisses). You don't want the chocolate to melt into a puddle. You just want it to be very soft. Test it with a wooden spoon. Remove trays from oven and quickly push one colored M&M into the center of each hug or kiss to flatten it. 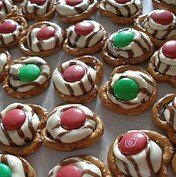 Allow pretzel kisses and and hugs to set at room temperature. You CAN place them in the refrigerator to speed up the process, but you will probably have trouble with the coatings on the M&M's once you remove them because of the condensation, so don't leave them in very long if you do. Now weren't those easy Christmas candies to make? For a pretty presentation, place a paper doily on a plate or platter before adding a layer of your chocolate pretzel candies. If you have some ideas for Christmas candies to make, please share them here. The more the "merrier!" *Photos by Julep67 at Flickr - Thanks!